I love this children’s book. It has all the elements of fun, especially if you are a fan of books about knights. 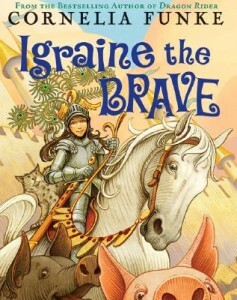 Laced with references to heroes from King Arthur’s tales, such as the Woeful Knight, and Pelleas, we meet Igraine, a magician’s daughter who longs to be a knight, and gets her chance. There’s humor, adventure, magic, and wonderful heroes and heroines in the mix of this children’s book. The parents get turned into pigs by mistake; the sorrowful knight gets to fight a longed-for battle, and Igraine becomes a real heroine. The writing is superb. I have been unable to read many of Cornelia Funke’s other award-winning books because they are a bit too intense for me, so I am so glad she created books like these. They show her great skill and are suitable for those of us with less tolerance for darkness and evil! It’s a great children’s book for girls who are coming of age, though I would hope some boys would love it too.